On Tuesday and Wednesday of this past week I attended school district professional development for teaching multiplication and division. Much of it was not new to me, but some of it was. It left me with many unanswered questions and I wondered what is going on in math instruction in other parts of the country. 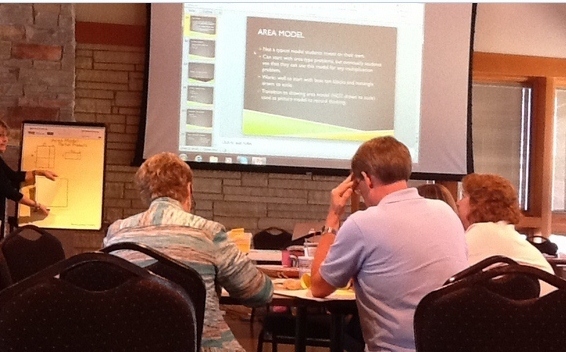 During the first part of the class we spent time looking at the NEW Iowa Core Standards, which is really just the Common Core Standards. Up until now, Iowa has had their own set of standards. I remember asking two years ago why we didn’t just go to the Common Core Standards then, if that’s where we were headed anyway. Well somehow in the two weeks since school dismissed for the summer, we have moved to the NEW Iowa Core Standards. I’m not sure when. Along with the standards we looked at the Common Core State Standards for Mathematical Practices and the instructor referred us to the Thinkmath Website. Here is a link to the Math Practices page. She repeatedly tried to impress on us that everything is going to be different now. Go to the website for explanations and examples. Is this different from when I started teaching fourth grade math, fifteen years ago? Yes, but I don’t see that it’s much different from what I’ve been doing for the past two to four years. We do lots of problem solving in our classroom, and students take a big role in presenting their thinking to the class. 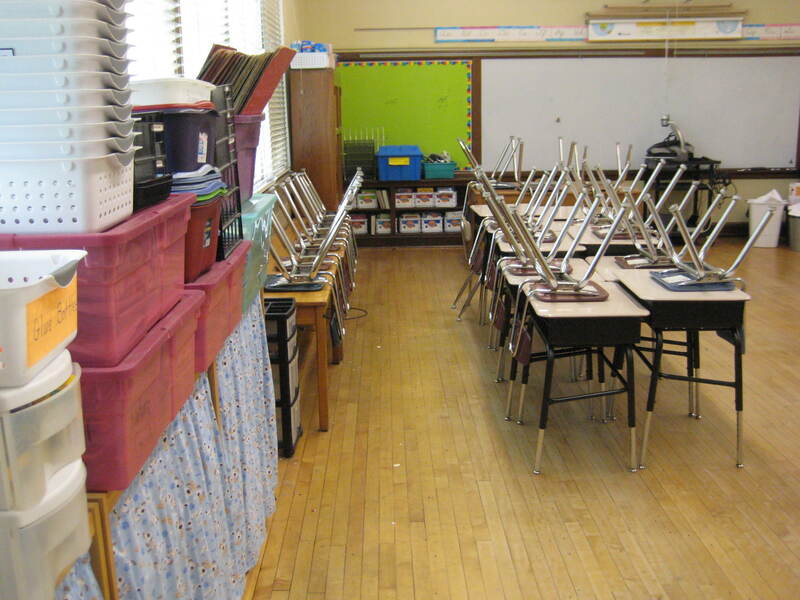 Despite popular opinion, most classrooms do evolve, at least the ones I’m familiar with do. The teachers at my school and throughout the district have devoted a lot of time to “unwrapping standards” and developing an understanding of Common Core Standards in every subject area. The big difference comes in the way people view and interpret the standards. I view them as minimums. I must be sure that my students can do at least this much by the time they leave 4th grade. As I read the standards, I don’t see that there is only one way to teach these skills. In this training we were explicitly told that we are to stay within our grade level and to go deep. So they view standards as limits, not minimums. What this means for kids is that my 4th grade students are not to be taught the traditional algorithm for either multiplication of large numbers or long division — AT ALL! All of the materials shared with us at this training, and at any I have taken in the past two years come form the book Teaching Student Centered Mathematics, by John Van de Walle. We were advised to begin with about fifteen minutes of review. Lessons are to be set up so that students work on solving one or two word problems during a class period. We spend about seventy-five minutes on math each day. They should use “Invented Problem Solving”. In other words, they figure out how to solve the problem on their own using whatever works for them. I am not supposed to teach students “Key Words for Problem Solving” because that limits their creative thinking. After they have worked individually on the problem, they will work with a partner to solve this same problem. After everyone has solved the problem, we are to have everyone show their work, being careful to explain their thinking to the class. After I have followed this plan for quite a while, I can teach students how to use the Area Model for solving multiplication problems. The same goes for division. I can eventually teach them Partial Quotient Division, but I am not to teach them the standard long division algorithm. They won’t learn that until sixth grade, if they need it at all. I am only to teach them the area model and partial quotient division near the end of the unit. Despite the fact that parents and most of the world know the more traditional algorithms, my students are not to learn them. Teachers will need to write most of these real world story problems for their students, because we don’t have materials that have been provided for us. When it comes to writing problems for students to solve, we were told to choose problems that force kids to think beyond simple concepts. We are not to start with easy problems and progress to harder problems. Kids need to plunge right into the more difficult concepts. I have always believed in building a foundation before moving into increasingly complex concepts. I worry about what all of this means for my students in the future. Will they have the necessary skills to move on to higher mathematics in high school and college? I spent the first day of class thinking a lot about retirement. By the second day, I had developed a plan for my classroom that I can hopefully live with. So, have things changed this much in your state? What’s going on with math instruction in your school district? Is this happening everywhere, or just here in the heartland? I am really prospecting for some ideas here. Thursday was the last day of school, and I have already stripped the bulletin boards, name tags, and posters out of my classroom. The books and materials are all safely stowed away for the summer. Summer vacation has officially begun. Despite what many people believe, teachers never really take the summer off. I have reading and math classes I will be taking this summer. We have a new reading series coming in, so I will be exploring that when it arrives. I am already wondering where I will store all the necessary materials. As I wrap up activities and store materials away, I begin thinking about how to make things better and be more effective for next year. I already have a three page list of “to do’s” for this summer. At the top of my list is to make a re-commitment to my own writing and blogging. This poor little blog has been sadly neglected over the past two years. During that time, I have been posting to my blog on Edublogger, called Day In the Classroom and to be honest, I haven’t been posting very often this year. I had planned to devote this blog to writing about our reading work, but that never happened. Now I’m planning to do some budget cutting, so I will be moving back to this blog as my main blog. Edublogger costs me money. In the coming weeks I will be reviewing and reflecting on the school year, and I plan to do it right here. My first big change was to change the name. 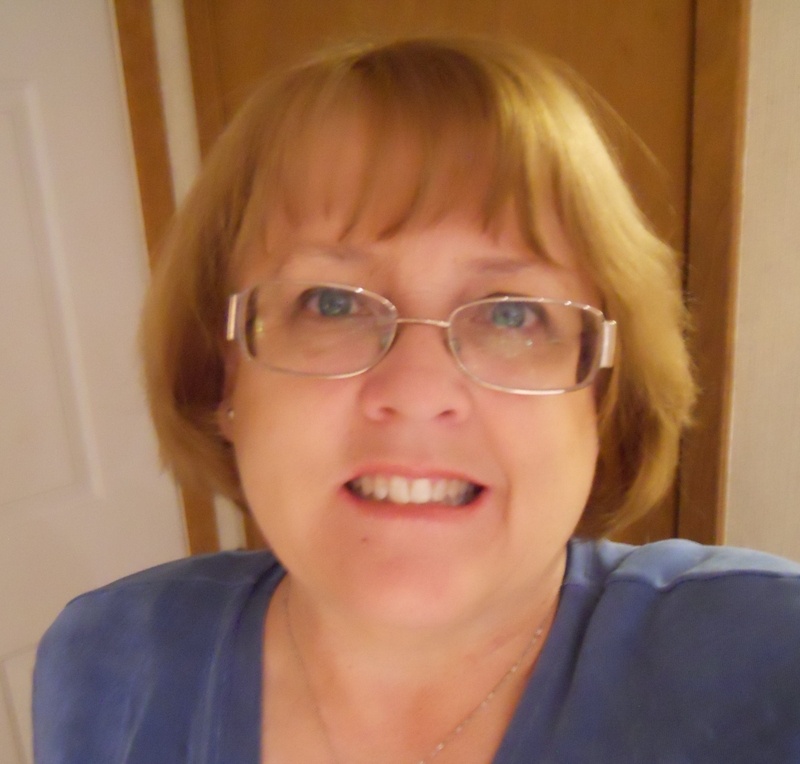 Now Prospecting For Treasure has become the new Day In the Classroom, because that’s who I am, Barbara Day, in the classroom. Speaking of our classroom, we had a lot of fun during these last two weeks of school. The kids conducted and presented independent studies. I’ll write about that next week. We ended our year with M & M Math. 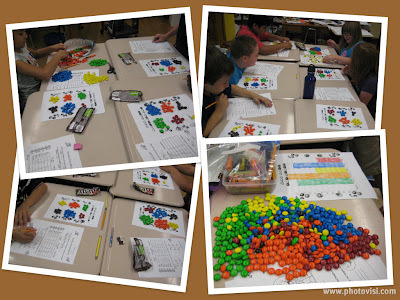 There are some really great resources on line for ideas to do math with M & M’s. The kids were all for it. I asked students to bring an individual size bag of plain chocolate M & M’s to use for math. A couple people showed up with large bags. If you buy the big bag, you end up with a lot more work to do. It made for a very colorful lesson. At the end of our class, everyone ate their math. Here is a link to the activities that I used for our lesson. M & M Activities. If you don’t find what you want here, do a Google search, and you’ll find loads of other ideas. 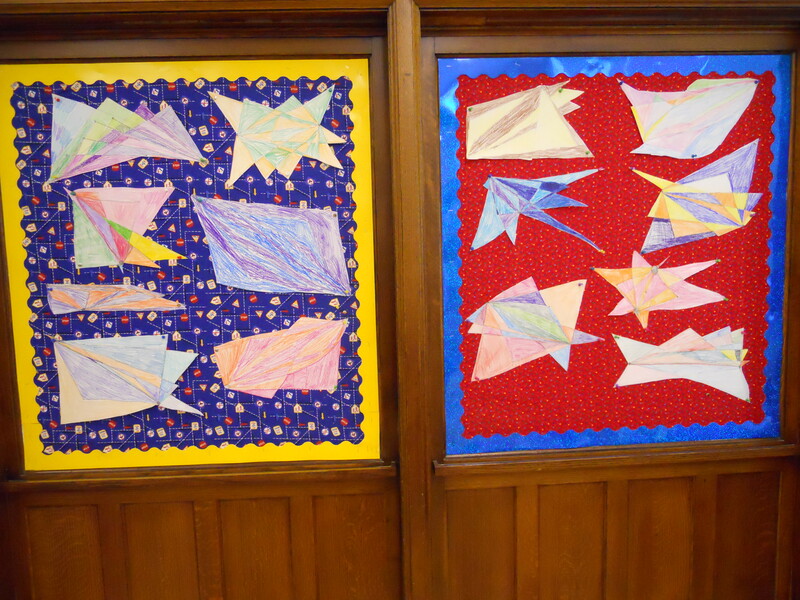 After drawing and coloring our Starburst Pictures, the children cut them out and we posted them on the bulletin boards. Thursday night I saw this link for Starburst Pictures on the Teaching Ideas website and tweeted by @Cristama on Twitter. The website includes step by step directions for constructing the designs. After a crazy week wrapping up our projects for Medieval History and preparing for Core Knowledge Night, which I will write more about in my next post, we needed a change of pace. We tried this project on Friday. We did it as part of our math lesson. After working on problem solving for a while, we reviewed geometry vocabulary; points, lines, line segments, angles, and vertices. We discussed obtuse and acute angles. (I am an expert at finding ways to connect things I want to do to district curriculum.) This activity also proved to be good practice in following directions. The step by step instructions included in the lesson plan, make this easy A few of us had to start over, because we had trouble with the directions. The kids were surprised and delighted with this little diversion from long division. Thank you @Cristama!